On this, the forty-fifth anniversary of the fists of freedom at the 1968 Olympics, we need a new Olympic Project for Human Rights. Dave Zirin is the co-author of The John Carlos Story: The Sports Moment That Changed the World. October 16 marks the forty-fifth anniversary of the day two young athletes brought protest to that most unlikely of places: the Olympic Games. 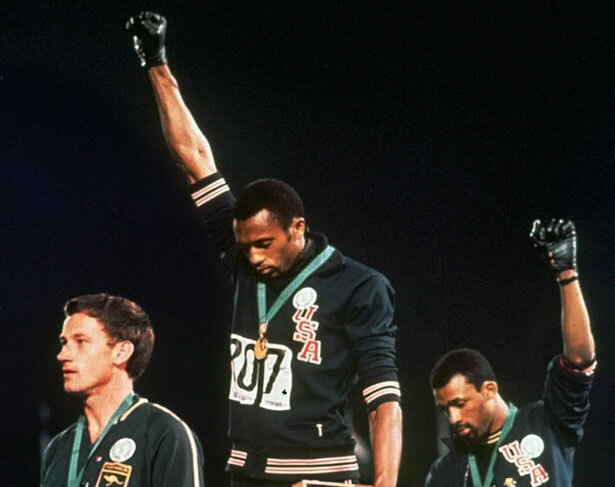 After the 200-meter dash, John Carlos and Tommie Smith raised their black gloved fists to the heavens, with Australian silver medalist Peter Norman standing in solidarity and creating an image for the ages. We may know that medal-stand moment. But it was more than a moment. It was a movement called the Olympic Project for Human Rights. Carlos, Smith and Norman all wore patches with those five simple words. Today, in 2013, the issues have certainly changed, but the need to revive, rebuild and relaunch an Olympic Project for Human Rights has never been more urgent. In 1968, the main demands of OPHR centered around the removal of open bigot “Slavery” Avery Brundage as head of the International Olympic Committee, ceasing participation of apartheid South Africa and Rhodesia, hiring more African-American coaches and restoring Muhammad Ali’s boxing title, stripped over his resistance to the United States’ war in Vietnam. Today, Avery Brundage, Rhodesia and apartheid South Africa are thankfully in history’s dustbin, African-American coaches are hired without controversy and Muhammad Ali has become a living saint. Yet the intersection of the Olympics and injustice remains if anything more pungent than in 1968. Today, the Olympics arrive on the shores of a host-nation like a neoliberal virus, displacing the nation’s poorest residents in the name of massive construction projects. Global corporations, with exclusive International Olympic Committee seals of approval, force local businesses to shut down as they brand the festivities like it’s a NASCAR event. The poor of a city are herded off, jailed or even disappeared in the name of making an Olympic city pristine for visiting dignitaries. Today, we are witnessing the mass evictions of thousands Rio de Janeiro’s poorest residents in the name of the 2016 games, and, as in London in 2012, the introduction of surveillance drones to monitor the proceedings. In Russia, President Vladimir Putin has outlawed demonstrations for sixty days before the 2014 Sochi Winter Olympics amidst both a shocking attack on the nation’s LGBT population, as well as an unprecedented carnival of graft. The idea of a new Olympic Project for Human Rights could have demands that directly address these issues. No involuntary evictions. No pre-emptive arrests of citizens. No awarding the games to countries that violate internationally recognized standards of human rights. No punishing athletes for speaking their minds and using the Olympics to take a stand for something other than McDonald’s and Pepsi. Would athletes be taking one hell of a risk by speaking out? Absolutely. Look at what Carlos, Smith and Norman suffered. First, there was the media barrage as the Los Angeles Times accused Smith and Carlos of a “Nazi-like salute” and the Chicago Tribune called their actions “an embarrassment visited upon the country,” an “act contemptuous of the United States,” and “an insult to their countrymen.” But the most shameful display was by a young reporter for the Chicago American named Brent Musburger who called them “a pair of black-skinned storm troopers”, a slur for which he has never apologized. Then upon returning home, Carlos, Smith and Norman faced the daily struggles of being pariahs and having to scrap just to survive. As Dr. Carlos said to me in 2003, “I don’t feel embraced, I feel like a survivor, like I survived cancer. It’s like if you are sick and no one wants to be around you, and when you’re well everyone who thought you would go down for good doesn’t even want to make eye contact. It was almost like we were on a deserted island. That’s where Tommy Smith and John Carlos were. But we survived.” This sacrifice of privilege and glory, fame and fortune, for a larger cause is something they never regretted. The best way to honor their sacrifice is not just to learn their story, praise their courage and pat ourselves on the back that we no longer face the specters of Avery Brundage and Rhodesia. It is to make the history come alive and demand justice from an International Olympic Committee that now has more in common with a criminal cartel than a guardian of what is best about sports. Dave Zirin looks at Bob Costas’ very public stand in the debate over the name of the Washington Redskins.